One of our precious designs for the spring and summer for little girls! 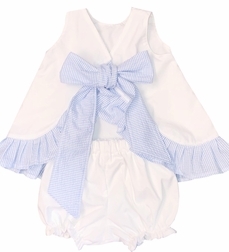 We start with white fabric and create a tie in the back swing top trimmed with your choice of fabric ruffle and sash and pair it with white fabric bloomers or shorts. If you choose the shorts, they also have a ruffle at the hem of each leg. 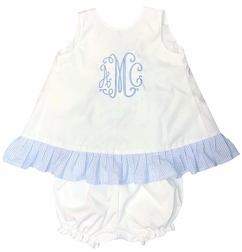 AND, don't forget the monogram!